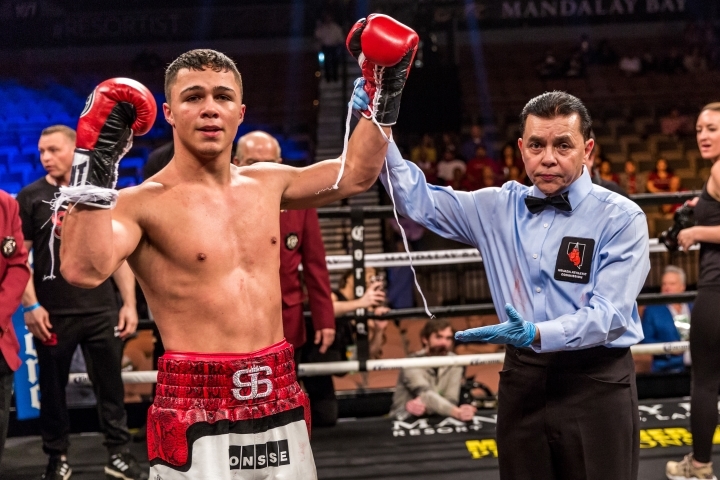 When fast-rising junior middleweight Joey Spencer enters the ring opposite Brandon Harder at the Microsoft Theatre in Los Angeles on FOX (8 p.m. ET/ 5 p.m. PT), the 18-year-old Lansing, Michigan, native will be after his sixth knockout in as many victories without a loss. But Spencer (5-0, 5 KOs) will also face a pair of firsts against the 39-year-old Harder (2-1, 1 KO) of Southaven, Mississippi, who represents his initial southpaw opponent and first with a winning record coming off June’s 92-second KO loss to Luis Lopez, a 22-year-old who is 5-0 with four knockouts. “[Harder’s] the first guy with a winning record and the first southpaw, but I’m not feeling any pressure and I’m not concerned about the winning record. The only thing that’s a step up in my book is the fact that he’s a southpaw. This is the first time I’m fighting a southpaw on the pro level, but we’ll see how that goes,” said Spencer, a native of Linden, Michigan, who is trained by his father, Jason, 42. Spencer’s fighting on the undercard of a 168-pound IBF defense by Jose Uzcategui (28-2, 23 KOs) against Caleb “Sweethands” Plant (17-0, 10 KOs), the latter of whom introduced himself following Spencer’s second fight last April at the Minneapolis Armory in Minneapolis – a three-knockdown first-round stoppage of Ousmane Sylla. Spencer is called “Little bro” by Plant, with whom he shares powerful advisor, Al Haymon. “We’re managed by the same people, so it’s really been a great thing having someone to look up and relate to who is eight years older and a little farther ahead in his career than I am. I’ll know the type of things that may be coming for me in the next couple of years,” said Spencer. Spencer’s interests in the sport were inspired by slap-boxing his younger by four years brother, Mickel, and seeing Jason’s, amateur fights. Spencer began attending his Dad’s matches as a 5-year-old, visiting gyms the following year and sparring as a 7-year-old. Spencer won his first amateur bout at age 8, and his first national tournament as an 11-year-old. Following Spencer’s pro debut — a second-round TKO of Uriel Gonzalez in February 2018 — Jason sold his US Diesel Remanufacturing company — which rebuilds old diesel engines – to his nephew in order to devote more time to his son’s goal of becoming a world champion by the time he’s 20. “Joey’s 100 percent a boxer-puncher. During these first few fights, he’s doing what he’s supposed to be doing with these opponents as far as getting them outta there early. But at the competition increases, you’ll see that he’s well-rounded, had great defense and has more to him than just the knockouts,” said Jason Spencer.